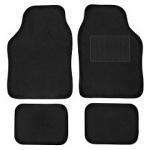 Protect your car interior with these floor mats. Ideal for keeping mud, dirty paw prints and all manner of chewy sweets off your car's carpets. I bought some "Milano" carpet car mats in Asda 2 days ago for £2.50 reduced from £5. I got some from non-slip ones from ASDA yesterday for £4 for those people who don't have a Sainsburys nearby. I voted hot as it is a good product at a good price...but, apart from the OP, did anyone manage to buy it at this price? It was at full price when I looked.